Whisk all ingredients together. Clean the pork tenderloin of fat and silverskin, then marinate for at least 24 hours. Remove from the marinade. Either grill or roast the pork until the internal temperature reaches 155 degree F. Remove from the oven and let rest 15 minutes before slicing. Serve with the Hoisin sauce. Heat a saucepan over medium heat. Add the vegetable oil, ginger, garlic, shallots and chili flakes. Sauté about 1 minute, and then add the Chateau Ste. Michelle Syrah. Reduce by half and then add the chicken stock, rice vinegar, Hoisin, and orange juice. Continue cooking over medium heat until mixture thickens, add the green onion and orange zest. 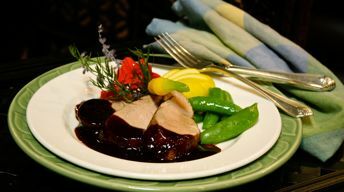 Drizzle over the sliced pork tenderloin.